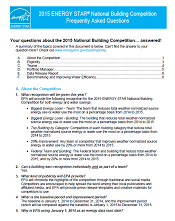 Use this calendar, based on the internal calendar EPA used for a year-long National Building Competition, to inform your Build Your Own Battle competition timeline. The calendar provides columns for you to set your own unique dates for your competition's milestones, and is organized by phases of a competition, including registration, final data collection, and winner annoucements. 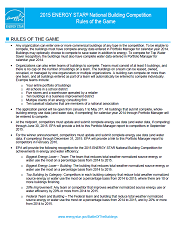 Use these materials, including talking points, promotional ideas, social media guide, and template newsletter article, stakeholder letter, press release, and blast email to help you promote your own ENERGY STAR® Battle of the Buildings competition! Use these templates as a starting point for emails you’ll likely send at each stage of your competition, including registration, kick-off, midpoint check-in, final weigh-in, and winner announcement. Fill in the templates with your competition details and keep in contact with your participants throughout your competition through email and social media. The template also includes sample instructions to include in a Data Request within Portfolio Manager.